Listen commercial free and get the best quality audio. Download our mobile app and get a 30 Day Free Trial. Enjoy the music the way it's meant to be with no commercial interruptions and without hearing or seeing advertisements. ClassicalRadio.com Premium subscribers enjoy audio quality that is twice as good as the free options. Compare the sound quality of our Free (40k AAC-HE) and Premium (320k MP3) streams to hear the difference for yourself. Tune in to the most cherished music of the ages including curated selections from the world's most renown composers, a variety of classical periods, favorite instrumentals, theatrical performances, and orchestral works. We are dedicated to keeping channels fresh by regularly adding new content for your listening pleasure. Listening without commercials is amazing! Classical music simply shouldn't be interrupted. The Premium service is worth every penny and so much more.. I enjoy the wide selection of channels and amazing music quality that's available with ClassicalRadio.com Premium. No other service offers a better curated selection. Your music selection is absolutely superb!! 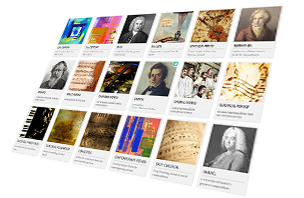 I've been a classical instructor for years and have never found a service like this that curates the periods and composers so well. Premium is outstanding with no commercials. Well done!